The governments of United States, Canada, and Mexico, on behalf of Partner in Flight organizations, announced the release of a ground-breaking report articulating tri-national priorities for bird conservation. 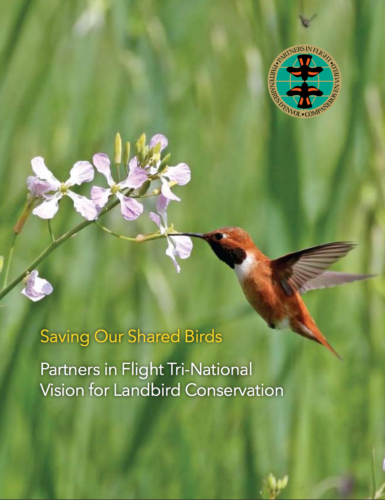 The report, Saving our Shared Birds: Partners in Flight Tri-National Vision for Landbird Conservation, was unveiled at the XVth Trilateral Committee for Wildlife and Ecosystem Conservation and Management annual meeting in Halifax, Nova Scotia. The report–a collaboration by bird conservation experts from the three nations’ leading conservation organizations–is the first comprehensive conservation assessment of bird species in North America. Release of this report also coincides with International Migratory Bird Day 2010, which celebrates the power of bird partnerships. Canada, Mexico, and the United States are home to 882 native landbird species, of which almost one-third depend on at least two of the countries for their survival throughout the year. The tri-national assessment identified 148 bird species in need of immediate conservation attention because of their highly threatened and declining populations. Most imperiled species include 44 bird species with very limited distributions, mostly in Mexico. Additionally, common bird populations are in decline with 42 common bird species decreasing by 50% or more in the past 40 years.